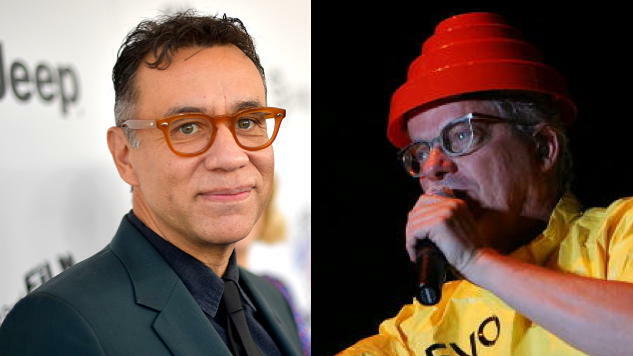 This past weekend, Portlandia star Fred Armisen joined the new-wave band onstage at the Burger Boogaloo festival in Oakland, Calif., for a performance of their classic dance hit. Armisen, a drummer as much as he is a comedian, joined the band onstage at the kit, decked out in his Devo-y best: an orange jumpsuit and a fire engine-red energy dome hat. Watch him perform with the band below. While known for his comedic work on Saturday Night Live, Portlandia and specials like Netflix’s Standup For Drummers, Armisen also famously drummed for the 8G Band, the house band for Late Night with Seth Meyers. However, he no longer frequents the late-night talk show. The eighth season of Portlandia, which he created with fellow musician/comedian combo Carrie Brownstein, recently aired on IFC. For more Portlandia fanfare, dig into our list of the 10 best food sketches from the hilariously satirical show. Armisen’s hilarious mannerisms are perhaps best exhibited in his interactions, so watch Paste’s 2009 interview with the comedian, below, to experience him in all his glory. Hear Paste archival audio of Devo whipping it circa 1980 beneath that.